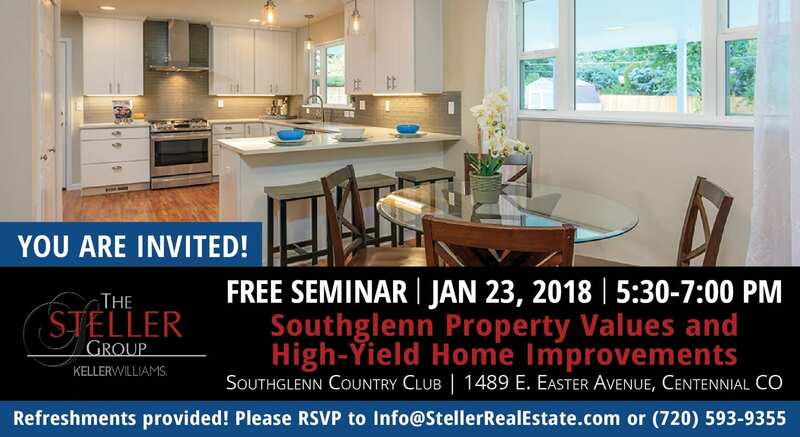 YOU ARE INVITED TO A FREE SEMINAR AT THE SOUTHGLENN COUNTRY CLUB! Learn valuable insights on how to best spend those renovation dollars from the award-winning real estate team, The Steller Group of Keller Williams, recognized as the #1 Keller Williams team in Colorado in 2017. You’ll also receive guidance on the difficult decisions and efforts that will achieve the maximum value from the sale of your home. The burden of executing the improvements is minimized, and completion allows our home sellers to capitalize on the profits available in the ever-changing real estate market. Moving is complicated, and for many of The Steller Group’s clients who have been in their homes for many years, it is simply overwhelming. We have a streamlined process for helping our clients navigate the sale process, and we act as the primary point of communication in coordinating all our clients’ moving needs. We are a team of trusted experts who work in concert with to make the move as painless and straightforward as possible for homeowners and their families. Refreshments and snacks will be provided. To register, please click here, email Info@StellerRealEstate.com or call us at 720-593-9355.